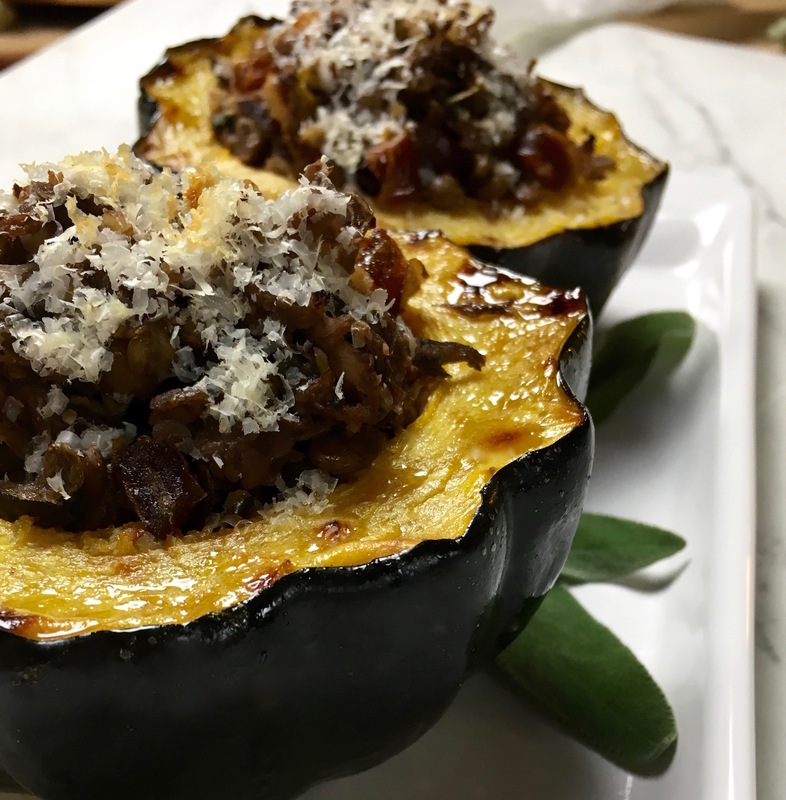 Looking for an acorn stuffed squash recipe? This is a protein packed dish that is filled with packed flavor. 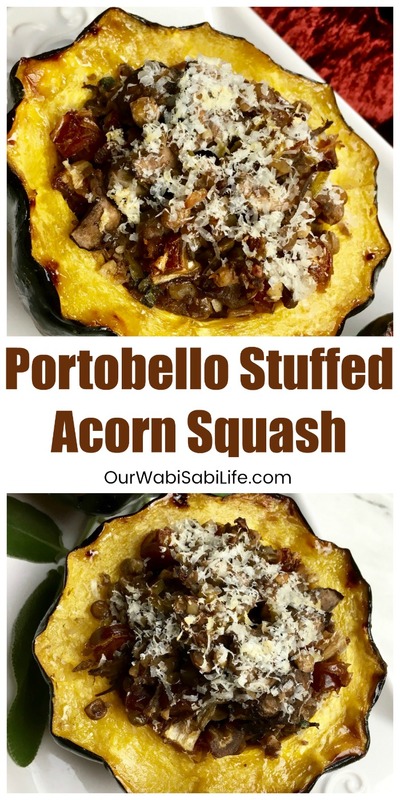 It can easily be changed to be a vegetarian stuffed acorn recipe. Enjoy this fall recipe for a delicious weeknight dinner. Acorn squash is fantastic as a fall dish. I have had sausage stuffed acorn squash many times. It is one of my favorites. 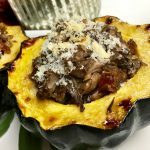 Taking the basic sausage acorn stuffed squash and replacing the sausage with mushrooms, turns this into an inexpensive meatless recipe that can be great for any night of the week. This recipe for stuffed acorn squash is close to being vegetarian and vegan but it does contain pancetta. If you are looking for a vegetarian stuffed acorn squash or a vegan stuffed acorn squash recipe, simply remove the pancetta. 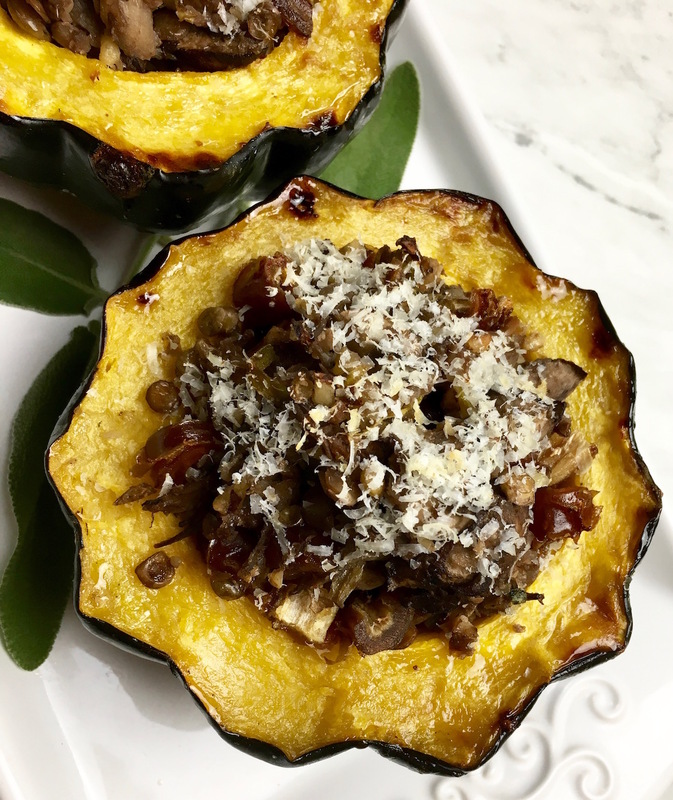 This stuffed acorn squash recipe is filled with lots of protein from the portabella mushrooms and the seasoning makes it full of flavor that it will taste amazing as a vegetarian stuffed acorn squash. 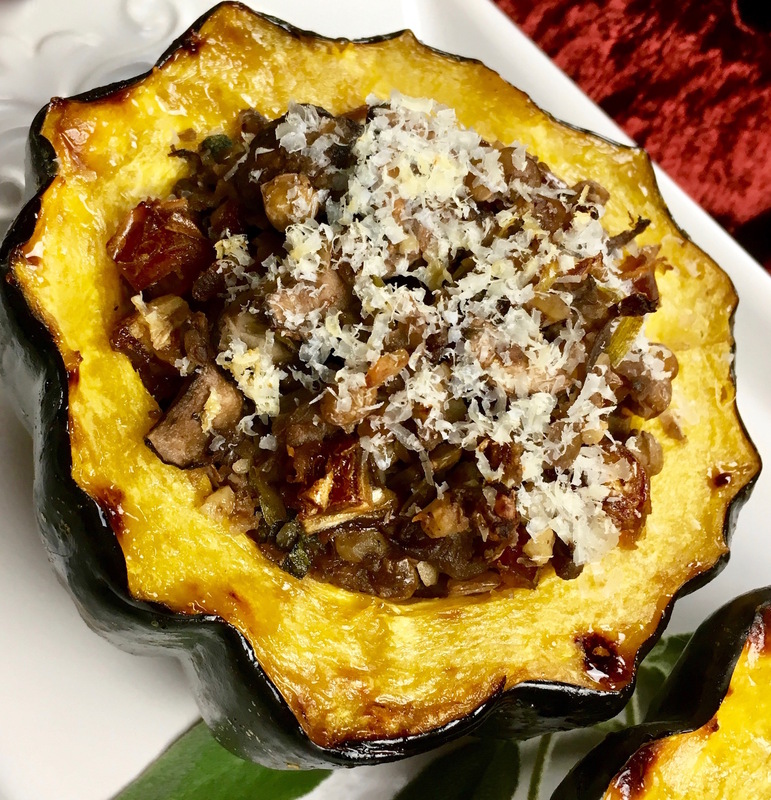 This protein-packed stuffed acorn squash provides a healthy and tasty alternative to traditional holiday side dishes. Crisp pancetta, rich Portobello mushrooms, sweet dates, and aromatic sage bring fabulous, yet diverse, flavor to every bite. As an added bonus, the lentils and walnuts make it more filling, so maybe you’ll be able to stop at just one piece of pumpkin pie this holiday season! Tip: Acorn squash seeds can be seasoned and toasted, just like pumpkin seeds. Reserve the seeds while preparing this recipe to enjoy as a healthy snack later. Position oven rack to center position, then preheat oven to 400°F. Spray a large baking dish with non-stick cooking spray and set aside. Place the acorn squash halves cut side up in the prepared baking dish and brush cut edges with one tablespoon olive oil. Season with salt and black pepper, to taste. Place baking dish on center rack in preheated oven and roast for 40 minutes, or until the squash is fork tender. In the meantime, heat the remaining olive oil in a large skillet over medium heat. Add minced garlic and pancetta and cook, stirring occasionally, until lightly browned, approximately 2-3 minutes. Add chopped mushrooms and cook, stirring occasionally, until they start to brown, approximately 4-5 minutes. Add sliced onions and continue cooking, stirring once or twice, for another 3-4 minutes. Stir green lentils, fresh sage, and red wine into the skillet. Cook, stirring occasionally, until mixture thickens, approximately 8-10 minutes. Remove from heat and stir in the chopped dates and toasted walnuts. Season with salt and black pepper, to taste. Set aside. When ready, remove cooked squash from oven and cool slightly before filling each half with the Portobello mushroom mixture. Sprinkle each half with some freshly grated Parmesan cheese. Return stuffed squash to oven for another 5-10 minutes, or until heated through and the cheese starts to melt. Remove from oven and serve immediately. Enjoy! 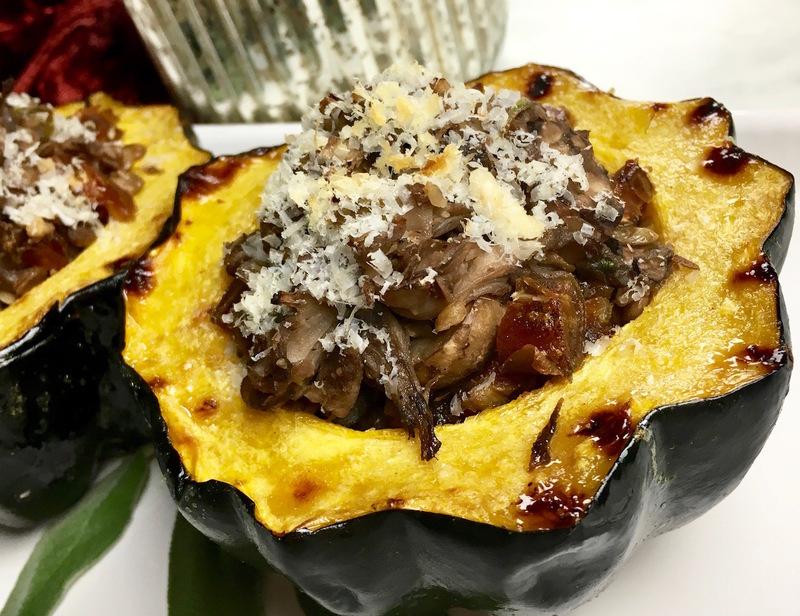 Place the acorn squash halves cut side up in prepared baking dish and brush cut edges with one tablespoon olive oil. Season with salt and black pepper, to taste. Place baking dish on center rack in pre-heated oven and roast for 40 minutes, or until the squash is fork tender. In the meantime, heat the remaining olive oil in a large skillet over medium heat. Add minced garlic and pancetta and cook, stirring occasionally, until slightly browned, approximately 2-3 minutes.